"Batman: No Man’s Land" is an American comic book crossover storyline that ran for almost all of 1999 through the Batman comic book titles published by DC Comics. The story architecture for "No Man's Land" and the outline of all the Batman continuity titles for 1999 were written by cartoonist Jordan B. Gorfinkel. The lead-up story began with the "Cataclysm" story arc, which described a major earthquake hitting Gotham City. This was followed by the storylines "Aftershocks" and then "Road to No Man's Land" which resulted in the U.S. government officially evacuating Gotham and then abandoning and isolating those who chose to remain in the city. "No Man’s Land" covered, in detail, a period in the lives of the residents of the city, explaining all events from the time of isolation, until its time of re-opening and the beginning of rebuilding. The main storyline ran through the monthly Batman titles Detective Comics, Batman, Batman: Shadow of the Bat, and Batman: Legends of the Dark Knight with other spin-offs serving as tie-ins. In all, "No Man's Land" encompassed 80 regular monthly issues, 4 specials, and the Batman: Harley Quinn graphic novel, which introduced Harley Quinn to the DC Universe. The storyline is divided into several arcs. A part of the story would continue from one Batman title and then to the next Batman title that would come the following week, much the same format used in the Superman comics for that time. Unlike the Superman comics, where a creative team is maintained for one monthly title, the same creative team is maintained for the duration of the story arc. The core storyline was originally collected as trade paperbacks in five volumes. However, because of the large number of issues that were devoted to "No Man's Land", only 40 of them made it into the original collections. DC has since released a new collection of "No Man's Land" that includes issues previously uncollected. A novelization of the story line was also written by Greg Rucka and released as hardcover in January 2000. Gotham City suffers the results of a magnitude 7.6 earthquake in the Cataclysm storyline. In response, the US government declares Gotham a "no man's land," destroys all bridges leading to the island and sets up a military blockade to prevent people from entering or exiting. Gangs and various supervillains Batman had battled over the years swiftly carve up the city. The city's police's commissioner, James Gordon, and several members of his department, who dub their gang the Blue Boys stay behind to protect civilians. Oracle and Huntress also end up on the inside. Bruce Wayne leaves the city to lobby the government to continue aid to Gotham, but fails. Gordon and his men wait for Batman's return, but he disappears for months, leading the police to believe that he has abandoned Gotham. A bitterly disappointed Gordon denounces Batman and refuses even to speak his name. Huntress attempts to keep order, fashioning a Batman costume. She soon discovers that criminals fear her more as Batman than they do as Huntress and succeeds in holding territory of her own. When Batman returns, he allows her to continue to use the costume. However, when she fails to hold off Two-Face and his army of men and loses Batman's territory, she abandons the costume. Batman and the police work separately to reclaim Gotham, piece by piece, by battling and subduing the gang leaders and then marking the reclaimed territory with graffiti. However, a schism erupts between Gordon and SWAT Lieutenant William "Billy" Pettit, whose militaristic, take-no-prisoners methods shock and outrage Gordon; the Blue Boys subsequently break into two separate factions, with most of Petit's officers siding with him to form the Strong Men. Various subplots emerge through the battles. Poison Ivy takes up residence in Robinson Park, and Batman — after helping her defeat Clayface's attempts to control the park and thus Gotham's fresh fruit supply — allows her to remain there as long as she cares for various orphans who had retreated to the park, as well as distributing food to the rest of the city. In addition, Victor Zsasz claimed a territory in Gotham City while Mr. Freeze did the same thing where he even competed against Gearhead whose armless and legless body was being carried around by the thuggish Tommy Mangles. Superman briefly visits the city to restore some degree of order, but quickly realizes that the city's current state of anarchy and 'might-makes-right' requires a greater effort than the 'quick-fix' he had been expecting and departs. He later returns as Clark Kent to visit Batman and advise locals on how to improve their burgeoning agriculture. A simultaneous story in JLA reveals that the Justice League keeps an eye on Gotham during this time by preventing various villains from claiming the territory for themselves. Robin's father, Jack, discovers that his son is in Gotham, and believing Tim entered the city for some sort of dare, petitions the government for a search and rescue for Tim which inadvertently attracts media attention and further public support for the city's revival. Gordon briefly allies himself with Two-Face to reclaim vital territory, but Two-Face betrays the alliance to claim a greater amount of land for himself. Two-Face also hires David Cain to kill Gordon, but his mute daughter Cassandra, who has become one of Oracle’s agents, thwarts Cain. Cassandra later becomes the second Batgirl to help clean up No Man's Land. Later, Two-Face kidnaps Gordon and puts him on trial for breaking the alliance. Police officer Renee Montoya reaches out to Two-Face's Harvey Dent persona, whose defense leads to Gordon's acquittal. While cross-examining himself, Dent concludes that Two-Face had essentially blackmailed Gordon into the alliance; hence, any agreement between them is null and void. Through the efforts of Lucius Fox, Batman succeeds in getting the attention of Lex Luthor, who arrives in Gotham with plans to completely rebuild the city. Attempts by the Joker to disrupt construction are thwarted by Bane, who has been hired by Luthor in exchange for his own private country. Bane, who has been causing trouble in No Man's Land before, is looking to get revenge on Batman, who convinces him to leave and claim his payment before Luthor reneges on their deal. Bowing to intense pressure from the people and the media, the government reverses the No Man's Land order and allows Gotham to rejoin the United States. Gordon and his surviving officers are promoted. On Christmas Day, the Joker attacks Pettit's compound. Pettit is killed and the Huntress barely survives a battle with the Joker's men. The Joker later kidnaps all of Gotham's babies, hiding them in the police station. When Sarah Essen Gordon stumbles upon the scene, the Joker shoots her in the head as she scrambles to catch a baby he dropped. Batman convinces a grief-stricken Gordon to refrain from killing the Joker, in order to prove that their city can still maintain its morale. When the Joker, who in the course of the Post-Crisis narrative has harmed Gordon's entire family, mockingly asks Gordon if he has a son, Gordon shoots the Joker through the kneecap instead; the Joker laments that he may never walk again, but then laughs hysterically upon realizing that he did the same thing to Gordon's daughter Barbara. Gordon then breaks down as Batman comforts him. Luthor's philanthropy is revealed to be a cover for his true intentions: to destroy the deeds to much of the property in Gotham and claim it for himself under false names. Lucius Fox, acting on a tip, discovers copies of the original documents and notifies Luthor. Luthor, feigning ignorance, attempts to kill Fox, but Batman intervenes and reveals that he is the one who anonymously tipped the Wayne Enterprises' CEO. He tells Luthor that Gotham is not for sale and warns him to leave. The story ends with the citizens of Gotham ringing in the New Year and fireworks exploded, while Gordon says his last goodbyes to his wife. Batman, placing roses at his parents' grave, prepares to spend another year as Gotham City's protector. 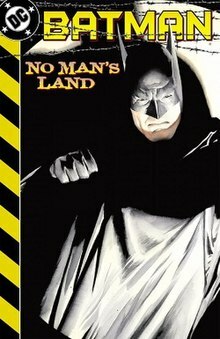 Two of the storylines immediately following "No Man's Land" were collected as trade paperbacks with the subtitles New Gotham 1 and New Gotham 2, respectively, playing up the fact that they were set in the rebuilt Gotham City following "No Man's Land". These were "Batman: Evolution" from Detective Comics #743-750 and "Batman: Officer Down", collecting the story from Batman #587, Robin #86, Birds of Prey #27, Catwoman #90, Nightwing #53, Detective Comics #754, and Gotham Knights #13. In December 2011, DC started re-issuing the storyline in "complete" editions that will collect all of the comics involved. Batman: No Man's Land #0. In the mid 2000s, an animated TV show based on the acclaimed No Man's Land storyline was put in development by producer James Tucker. Coran Stone worked in the project making some designs, but the project was ultimately scrapped for being "too dark", so Warner Bros. Animation and Cartoon Network decided to focus on Batman: The Brave and the Bold instead. In the late 2000s, Tucker made another attempt to use the storyline of No Man's Land as a TV series, but now with CGI animation instead of traditional animation. Some artworks were made, but the project was finally cancelled for having a dark premise like the previous attempt. The fourth season of Gotham adapted some elements of the storyline of No Man's Land. In addition, the season finale has been named after the comic. It starts when Jeremiah Valeska had planted his generator bombs at the bridges when he allied with Ra's al Ghul and the League of Shadows. When Barbara Kean forced Bruce's hands into wielding the embalming knife to stab Ra's al Ghul again, the bombs went off destroying the bridges as Ra's al Ghul tells Bruce to embrace his destiny. As most of Gotham City's civilians are evacuated by boat including Alfred Pennyworth and an injured Selina Kyle, Bruce remains behind to help James Gordon, Harvey Bullock, Lucius Fox, and the remaining members of the Gotham City Police Department. As a result of Gotham City being declared a "no man's land" by the governor, Oswald Cobblepot, Victor Fries, Bridgit Pike, Jonathan Crane, Barbara Kean, and other criminals started claiming territories across Gotham City. Towards the end of The Dark Knight, Gotham is evacuated as the police and Batman combat the Joker and his forces, slightly similar to the events of No Man's Land. Elements of No Man's Land are used in the film The Dark Knight Rises; while there is no earthquake, Bane sets off various bombs that damage key areas of Gotham and destroy all but one of its bridges, forcing the citizens to remain inside Gotham as a nuclear bomb counts down and they are forced to band together as various gangs to survive the anarchy created by Bane's actions. Gordon is put on trial by Scarecrow that is reminiscent of his trial by Two-Face. Also used is the notion of Bane serving as an enforcer for John Daggett, who fills in for Lex Luthor, with a similar agenda to take over Wayne Enterprises, instead of taking over Gotham; however, where Bane simply abandoned Luthor in the comics, the film sees Bane kill Daggett once he has served his purpose of helping Bane get his resources into Gotham to mount his own coup. This is also a slight reference to Batman: The Animated Series season one's two-part episode Feat of Clay and episode Appointment in Crime Alley. Elements of No Man's Land are also used in the video game Batman: Arkham City, using the idea of a supervillain turf war after Gotham is cut off from the rest of civilization (although in this case only part of Gotham has been cut off, with parts of the city turned into a prison to contain the various criminals ala Escape From New York). Also, an earthquake is said to have taken place before the game's events, flooding the "Amusement Mile" section of Gotham under water. Hugo Strange and other authorities tell the public that they need not worry about these collapses. However, it is implied that these may have been caused by Ra's al Ghul's digging through the old, dilapidated parts of Gotham which have been built over in order to find his old Lazarus Pit in the former "Wonder City" area of Gotham. This area (and Wonder Tower, which remains above the surface), are where Strange and Ra's conduct their plan to eliminate all criminals in Gotham City, and eventually, the world. In the first game of the InFAMOUS superhero video game series, many plot elements of Batman: No Man's Land are used. After a catastrophic disaster and plague outbreak, Empire City is cut off from the rest of the country by a military enforced Quarantine, keeping anyone from entering or leaving and practically abandoning the city and all within it. Due to the lack of outside intervention, police presence and post apocalyptic state of the city causes society within the city to collapse as well as criminals and conduit supervillain gang leaders to take over certain Burroughs and start a massive gang war to control the city. Director Nate Fox stated that much of the inspiration of the superhero story came from two DC Comics series, DMZ and Batman: No Man's Land. Both center on a city after a large disaster. The series also inspired the crafting of the game's grim take on the superhero genre. Cover of the hardcover by Greg Rucka. Art by Joe DeVito. In 2000, DC Comics published a novelization of "No Man's Land" written by Greg Rucka. The story features many of the same characters as the comic book arc. It also describes other members of the GCPD. The book omits the characters of Azrael and Superman, who were present throughout in the comics. There is also a shorter junior novel written by Alan Grant. GraphicAudio produced an audiobook of the novelization which spans two volumes and features a full cast, music and sound effects. The first part was released in October and the second in November 2011. ^ "Backstage - Rejected/Unproduced Series & Movie Pitches". Worldsfinestonline.com. n.d. Archived from the original on December 17, 2016. An animated series based on the acclaimed Batman comic storyline "No Man's Land" has been a popular premise, with multiple attempted made. The piece of artwork above, by character designer Coran Stone, is one of the more notable attempts. Stone said he was selected by producer James Tucker to do the character designs for a "No Man's Land"-based cartoon, but the project was ultimate scrapped since it was considered "too dark." ^ "Backstage - Rejected/Unproduced Series & Movie Pitches". Worldsfinestonline.com. n.d. Archived from the original on December 17, 2016. A second attempt to create an animated series based on the "No Man's Land" comics was attempted, this time with a CG-animation bent to it. Also stalled for the dark premise, James Tucker would have been producer for this mid/late 2000s series. The design artwork above does not have an artist listed.